This particular Centaur apparently came from Tyrells Racing Factory in Woking when they closed down their workshops, and was rumoured to have been used by them as a paddock bike in the early sixties. The engine is an American Clinton 49cc. It runs, and you start it like a lawnmower, with a pull-cord. I believe the company is still in existence, making industrial engines. 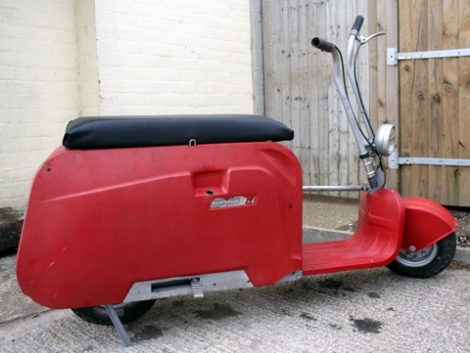 The scooter was manufactured by Lombard Industries in Massachusetts, between 1960 and 1962, and sold for $410. This is another example of a totally good idea that had not yet been fully developed. The scooter, when folded, is too heavy to carry as a ‘suitcase’ (though one person can actually carry it). Clinton lawnmower engines no doubt worked fine when brand new; but engines started by pull-cords are a pain 48 years down the road. Though I’ve fired it up several times, it takes a lot of pulling to get it started. Another white elephant - and all the more delightful for it. Of course, when folded it takes up very little room, so is ideal to take to shows. I've never met anyone who’s seen one before, so it is also fun demonstrating how it works.